Though it’s a bit of a loaded question, we often hear, “are they worth it?” from patients considering dental implants. “Worth it” often refers to expense, and it’s no secret that dental implants are expensive. But “worth it” can also refer to going through the process, caring for them, and their impact on overall health. So to really answer this question, we have to look at all of these aspects. In the end, only you can really decide if implants are right for you. We are here to provide the information so you can do that confidently. The price tag is usually the biggest barrier to patients moving forward with implants, so let’s tackle that one first. You can read more about the cost of implants here. But to summarize, if you are looking at the cost of implants vs the cost of dentures, you need to understand the long-term expenses that come with each. 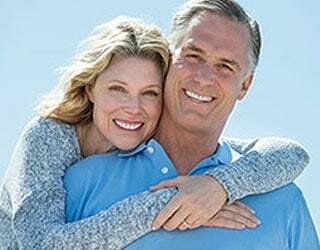 Implants cost more up front, but dentures do not last forever. You can expect to spend several thousand dollars on a new complete set of dentures every 7-10 years. And that life span is assuming only moderate changes in gum tissue and bone density over time. Dental implants themselves can easily last for 25 years. Then prosthetic will need to be replaced more quickly, but not as quickly as with traditional dentures because we do not expect to see major changes in bone structure with implants. There is no question that dental implants are worth it in terms of restoring tooth function. This is the closest we can get you to feeling like natural teeth. Options like partials and dentures are functional, but do not feel the same, because they are only sitting on the surface instead of being anchored into your jaw the way natural teeth roots are. As we have mentioned on other pages, when teeth are missing the jaw bone begins to deteriorate. With dental implants in place, we can prevent this from happening. This is because your jaw bone exists to hold your teeth in place. No teeth, no need for the bone. With dental implants anchored firmly in the bone, that bone continues to serve its intended purpose. When the bone begins to erode, patients will see changes to their facial structure, suffer difficulty eating nutritious foods, and dentures and partials will not fit the same. Daily care of implants is much more straightforward than daily care of removable prosthetics. The implants are a permanent part of your mouth, and care is the same as if you had all your natural teeth. For example, let’s look at an implant-supported bridge versus a removable partial as an example. The bridge option is permanently attached, and you brush and floss like normal. The partial must be removed at night, stored in a cleaning solution, and cleaned regularly outside of your regular oral hygiene process for your natural teeth. In the example of an implant-supported denture versus a traditional denture, you will still need to care for that prosthetic the same as for the bridge, though if you are in full dentures, you do not also have natural teeth you have to maintain separately. However, no matter how many natural teeth you have, you must care for your gums and tongue, as harmful bacteria can still collect here. The biggest point we want to communicate to our patients is that complete health begins with the mouth. Serious medical conditions ranging from heart disease and dementia to malnutrition and even preterm labor can all be traced back to your oral health. Some of these, like heart disease, are traced back to harmful oral bacteria finding its way into the bloodstream. Others, like malnutrition, are because patients cannot physically consume the nutrients they need due to their missing teeth. This is why we feel strongly that no matter which option you choose, replacing missing teeth is better than going without.